One Friday afternoon, Yossi and Laibel are confronted with a seemingly impossible task. With the right attitude and a little ingenuity, the two brothers find out that they can try hard and succeed. Lively illustrations and bouncy rhymes make this book a joy to look at and fun to read! 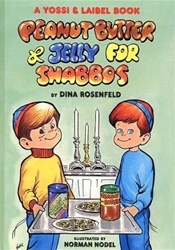 A Holiday for Noah Braid the Challah - A Playful Action Rhyme I Honor Shabbos: A Childrens Guide to Appreciating Shabbos Can't Wait for Shabbos!